Stories from Stone now in Paperback! 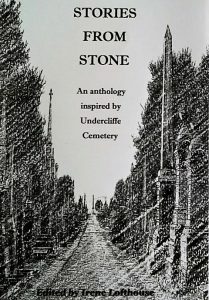 Stories From Stone, is an anthology of work inspired by Undercliffe Cemetery. Christine Edmonds Alyson Faye, Jill Lang, Gillian Wright, Pam Line (all pictured) and Stuart Firth. The writers led more than 50 people on a tour of the cemetery and gave readings of their work with the appropriate setting. Best selling author Irene Lofthouse, led the creative writing course based at The Lodge within the grounds of the site. The writers, over a period of four months, explored, discovered and researched the lives and deaths and monuments of those who are remembered. Undercliffe is not just a cemetery its also a time capsule that contains a wealth of detail that gives us an extraordinary glimpse into the lives of Bradfordians. Irene said “The cemetery was very much part of everyday life. As the industrial revolution took hold, Bradford’s population exploded as the mills demanded more workers. As the city’s wealth expanded so did the poverty and the mortality rate, especially among infants, rocketed. With an expanding economy, people flocked to the mills, from Ireland, Germany, Poland, Russia aswell as many rural areas from across the country. With this dramatic influx of people came great pressures and problems with housing, health and education. The local churchyards and burial grounds were very quickly full. 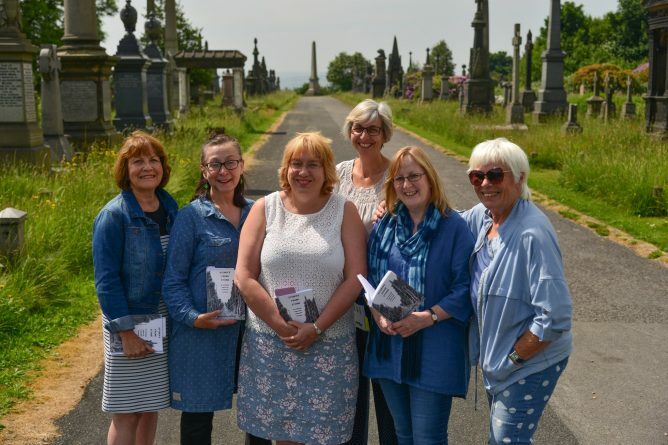 It was a very successfull afternoon and Chairman of the Undercliffe Cemetery Trust, Mr. Allan Hillary was “delighted with the range and depth of the work contained within the book. The anthology has a great mix of tales, poetry, prose and limericks! with more than a touch of humour.” He also thanked the volunteers who help maintain and look after the site, and those behind the scenes, who contributed to the wonderful occasion. “Its part of our ongoing campaign to promote, preserve and realise the potential of this jewel in Bradford’s crown.We are developing our activities and we have some exciting announcements to come. Enquiries from all sections of the community who may like to hire The Lodge for an event, a meeting or would like to arrange a guided tour. The event raised just over £200, all of which will help support and fund the work in caring for the Grade II* Listed Heritage Site. Details of where to buy your copy will be coming soon! Email us and we’ll keep you informed.